A call has been made for a full public inquiry into issues which have seen a brand new school campus in Dumfries closed on safety grounds. 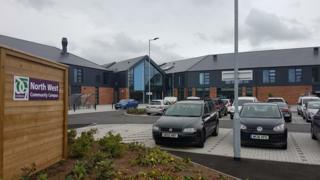 Dumfries and Galloway Council shut the North West Community Campus on Friday after a smart board struck a pupil. MSP Finlay Carson said local people and parents were "demanding answers" and called for the inquiry. Education Secretary John Swinney said there would have to be investigations to establish what had gone wrong. Mr Carson - along with fellow MSPs Emma Harper, Colin Smyth and Joan McAlpine - raised the situation at the £28m facility during topical questions. "Parents and staff are hugely concerned that the North West Community Campus is unsafe," he said. "We have seen ceilings collapse, a door injuring a child after coming off its rails and the latest incident saw a child hit by a falling electronic whiteboard." He said this had come despite assurances "far greater levels of checks" than normal had been carried out. Mr Swinney said the safety of students and staff was the "absolute concern" and he had seen evidence of "extensive work" by the council to ensure the quality of the building was as it should have been. He said it was up the local authority to hold the contractor's Graham to account and confirmed there would be talks between the company and the council later this week. "None of these things should be anticipated or expected in the delivery of a school building," he said. "There will have to be investigations into what has gone wrong here - there will have to be transparency around these issues." He said that was the only way to provide the reassurance parents, staff, pupils and the council should expect. Meanwhile, Dumfries and Galloway Council has confirmed the hundreds of children from the campus will be taught at other schools until the site reopens. It is seeking an "absolute assurance" that every classroom in the building is safe. The council stressed it was "committed" to getting the North West Community Campus open again.